November 3, 2008 – The use of shoulder pain pumps has been linked to post-arthroscopic glenohumeral chrondrolysis (PAGCL), a painful and permanent condition that results in the breakdown and deterioration of the cartilage in the shoulder. Pain pumps may also be used in knee or ankle surgery, which can lead to chondrolysis in these joints as well. A shoulder pain pump is a medical device with a catheter that is implanted into the shoulder during arthroscopic surgery to alleviate post-operative shoulder joint pain. Shoulder pain pumps work by infusing pain medication directly into the shoulder through the catheter continuously until post-operative pain subsides. The link between shoulder pain pumps and PAGCL was only recently established through medical studies, including a study published in the October 2007 issue of The American Journal of Sports Medicine. According to the study, as much as 63 percent of patients who use shoulder pain pumps are at risk of developing PAGCL. Due to the high risk of PAGCL, the study’s authors recommend that patients avoid using shoulder pain pumps, especially those that use bupivacaine with epinephrine, until their effects are further studied. With PAGCL, hyaline cartilage in the shoulder joint is destroyed, leaving an individual with a limited range of motion and constant pain. Unfortunately, PAGCL treatments are merely palliative, meaning they merely treat PAGCL symptoms and do not cure the condition. Typically, pain medication and further shoulder surgery, including shoulder replacement surgery, are the only treatment options for PAGCL. At least 30 pain pump lawsuits are now pending in the U.S. against the companies that manufacture, market or distribute post-operative shoulder pain pumps, including the Stryker pain pump, DJO Inc., I-Flow Inc., BREG Inc., On Q pain pump and others. The shoulder pain pump lawsuits, brought by shoulder pain pump lawyers, include many different claims. For example, the pain pump lawsuits allege that the manufacturers of shoulder pain pumps failed to instruct or warn the U.S. medical community that the safety of using the pain pumps in the shoulder joint had not been established. Additionally, the lawsuits claim that continuous injections of commonly used anesthetics (pain drugs) may cause permanent injury. The anesthetics used include lidocaine (xylocaine) or Marcaine (bupivacaine) with or without epineprine. If you or a loved one has suffered serious side effects or injuries after using a shoulder pain pump, you may be entitled to compensation for your injuries. Contact us today for a free and confidential pain pump lawsuit review. Bernstein Liebhard is a nationally recognized law firm located in New York City that exclusively represents injured plaintiffs in a variety of individual and class actions nationwide. 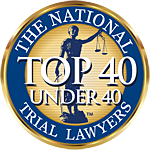 We have been ranked among the top plaintiffs law firms in the coutry by the National Law Journal for the past six years–an honor achieved by only one other law firm in the the United States. Our experienced pain pump trial attorneys are standing by ready to review your case. We represent our injured clients on a contigency fee basis, meaning that we advance all costs and do not collect any attorneys fees unless we are successful.